Lightly grease and line a 20cm by 14cm loaf pan with nonstick parchment paper. 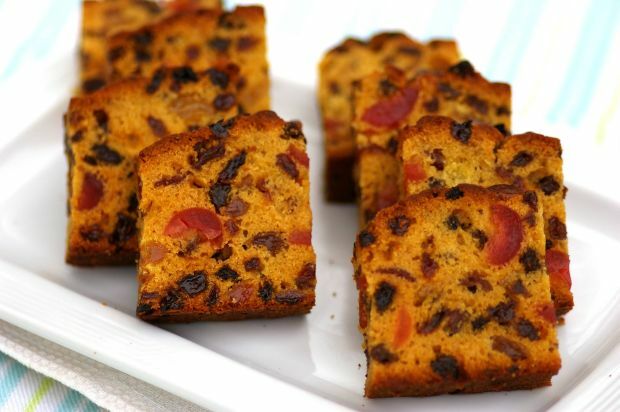 Combine sultanas, raisins and glazed cherries with orange juice, sugar and butter in a nonstick saucepan. Cook and stir over medium low heat until sugar dissolves. Reduce the heat and add rum. Simmer for 10 minutes. Remove from the heat and transfer to a mixing bowl. Leave to cool completely. Beat eggs lightly with essence and pour into the cooled fruit mixture. Sift the high-protein and self-raising flour together and stir into the egg mixture to mix. Transfer batter to the prepared pan and bake in a preheated oven at 170°C for about 1 hour 15 minutes or until cake is cooked through when tested with a wooden skewer. Allow the cake to sit in the pan for 20 minutes before transferring to a wire rack to cool completely. Tip: To prevent the cake from drying out, use a satay stick to prick holes in it at random and drizzle over extra rum. Wrap with aluminium foil for 5-6 hours before cutting or slicing. little sugar. 70 gr only. ? ?